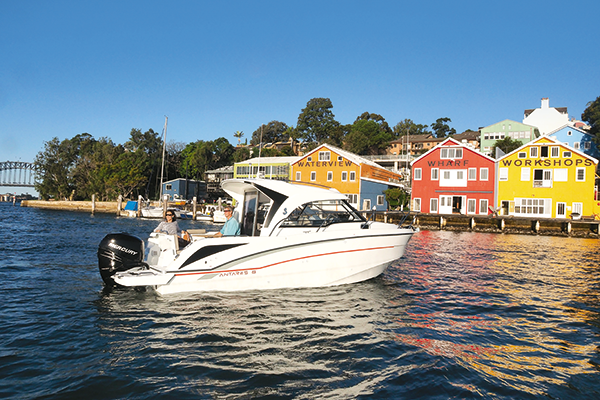 Delivering the performance two-stroke fans love in a quiet four-stroke package makes the Verado great for cruisers. When the 200hp six-cylinder Verado joined Mercury’s original 1.7L four-cylinder version in the line-up a couple of years ago, it gave the range a shot of extra torque. And that’s saying something because the smaller-capacity motor punched well above its weight and delivered lowdown two-stroke punch to four-stroke fans. In choosing the six, Beneteau dealer Mark Chapman was attracted to the smoother and quieter power delivery that fits the cruising Antares. He decided it would be worth the extra $6000 in cost, especially as it includes Mercury’s superb built-in power steering. This choice was proven with time at the wheel, lock to lock turns being executed smoothly and without effort. While the six-banger boasts loads of high-performance technology, it weighs 57kg over its little sister. However, on the Antares I thought this weight actually benefitted the ride by balancing the boat well and transferring bulk to the stern, planting the Beneteau hull firmly in the water. 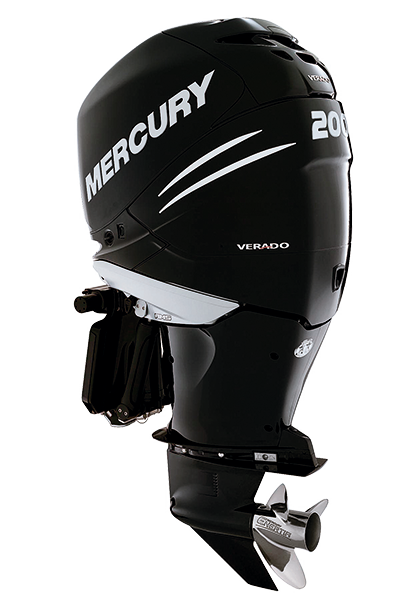 The Verado’s power comes from the force-fed flow of air into the engine through computer-controlled multi-point fuel injection, with the main CPU adjusting boost to deliver just the right fuel mixture right throughout the rev range. Electronic throttle and shift combine with a Flo-Torq Soft Shift Rubber Hub system for effortless, clunk-free gear selection. Acceleration from the single Verado was fast and smooth; we were out of the hole at 15kt and 3200rpm. We maintained this speed without falling off the plane or suffering undue vibration. Planting the throttle from any revs up to WOT gave an instant spurt of speed. Cruising at 27kt and 4500rpm consumed 52L/h of 92RON, for a range of 130nm keeping a 10 per cent reserve in the 280L tank. Even at full noise and 34kt consumption was a reasonable 79L/h, giving a 108nm range. Sparkling acceleration, good cruising speeds and smooth delivery – to my mind the larger single Verado 200 was a good match for the nearly 2500kg all-up weight of the Antares 8 OB. Two people on board, light load (50 per cent fuel), Enertia 14.5x16in prop. 220L fuel tank (range calculations leaving 10 per cent reserve).